No worrying! Do your experiments with confidence, knowing that your pipettes are delivering accurate volumes. No waiting! 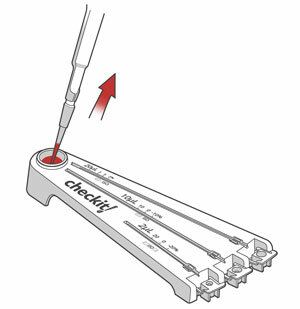 Evaluate pipette accuracy on the spot in just seconds – no matter where you are. Why mess with a high-precision balance? 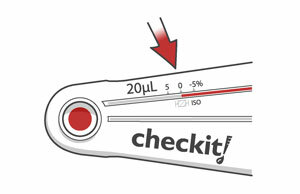 Checkit is fast and easy. And no worries about evaporation or air currents. Your measured drop is encased in a glass tube within seconds, so the values won’t change while you’re trying to read them. Download the Pipette Checkit brochure. Each Pipette Checkit® has three precision glass capillaries matched to the top, middle, and low end of the range of your pipette. Pipet the three diagnostic volumes into the matching sample wells, flip the wells into measurement position, and take your readings. The pipetted volumes are compared to easy-to-read graduations that tell you instantly whether the pipette needs adjustment. Step 1: Draw dye into the pipette tip. 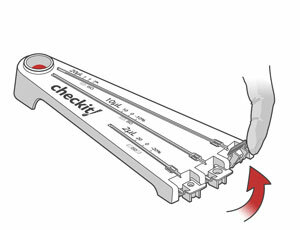 Place the Checkit on a level surface. Grasp the pull tab on the reservoir seal and peel it off to expose the measurement fluid. 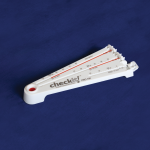 Fit your pipette with an appropriate pipette tip (not a filter or gel-loading tip). Set your pipette volume. Then draw the dye (measurement fluid) from the reservoir into the tip. Step 2: Dispense dye into a well. Pipet the liquid into the first well of the Checkit. Step 3: Flip up the well tab. Use your finger tip to rotate the well to the vertical position. The droplet will automatically be drawn into the measurement capillary. Use the scale printed on the Checkit cartridge to determine the actual dispensed volume. Then repeat for the middle (50% of largest volume) and bottom (10% of largest volume) of the range of your pipette. Note: Always wear personal protective equipment (PPE) including goggles. A light touch is all that is needed to lift the tab, until you feel it stop moving. Do not push hard, or you will risk breaking the end of the capillary. Leaving the tab up will reduce evaporation, thereby providing you more time to compare the meniscus to the adjacent markings. First when dispensing into the well, if you do a blowout, lift the end of the pipette tip out of the pool of dye in the well. How do I center the dye in the well? You can touch your pipette tip to the bottom of the well to help find the center. On the smaller volume wells, you can feel a divot at the bottom to guide the pipette tip. 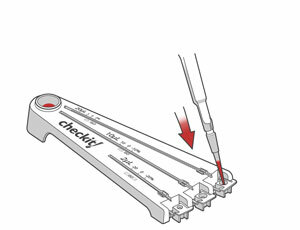 You can also use your pipette tip, carefully, to help guide dye to center after pipetting. If your hands are shaky, it helps to use two hands when pipetting or ask someone else for assistance. It is accurate to within 1%, aside from external influences such as evaporation. We suggest that you test the high end of the range first, then the middle, and finally the low end. For example, with a 20uL Checkit, first test it for 20 uL, then for 10 uL, and finally for 2uL.